Best Home Depot Hacks | Homesteading Tips & Tricks! Catch our 32 Home Depot hacks and tips for excellent home ideas that you can do on a budget. It’s amazing what you can create with your own two hands with just a little effort. You’ll love these home depot hacks we’ve compiled below. Did you know YOU have the power it takes to create? Your hands and your brain are your best tools, and with just a little bit of guidance, and the right supplies, you are capable of creating (or recreating) just about anything! Here we have some of the best Home Depot hacks around. As a fellow homesteader, we’re obsessed with anything that is efficient, functional, practical… and nice to look at. So we thought we’d rally up some of our favorite homesteading hacks – and share them with you! What’s a homesteading hack? Anything that you can make yourself, instead of buying it in store. Hop on down to our favorite homesteading store: home depot, for all the supplies you’ll need. Home Depot, the giant home improvement superstore, is our go to resource for all things homesteading, and I have a feeling it’s yours too. (Though, remember folks, any time you can buy something locally sourced the better, best to help out your neighbors first!) Keep reading for the best home depot hacks and homesteading tips. Why waste dollars when you can have it at the cheapest price with the same design. Make this one yourself with lumber and a nice dark wood stain. 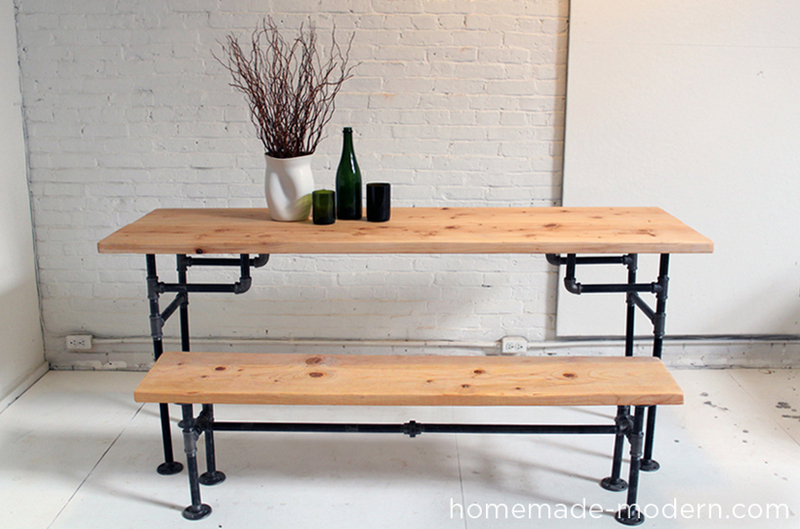 Check this video on how to create your own wood and iron table. What a great idea for Mom’s out there or for those who love to soak themselves in the tub. This was made with a piece of wood, cut perfectly to fit over the tub’s ledge. What a fun minimilist stool, made from wood dowel’s dipped in paint, and a cement seat. An easy tutorial is just a click away. Instead of buying some modernized tv rack why not with this budget friendly plywood media console? You can watch an easy DIY tutorial just by clicking here. This beautiful coffee table can go indoors or outdoors! I love the idea. For an easy how to tutorial, please click here! Make your own burlap curtains without touching a sewing machine. Learn how here. This easy-to-install slide out shelf is perfect for dividing and organizing your things, especially in the kitchen. Pipe shoe racks rock! Cut up your PVC and glue them together in this honeycomb formation for easy shoe retrieval. This fun bucket stool is a perfect Home Depot Hack. Go grab your home dept 10 gallon buckets, and create your own fabric-covered seat cushion for fun homesteading DIY storage pods! Welcome guests with rustic flair and make yourself this wooden bench with Home Depot! Make it here. Great idea if 1) you love honey, and 2) you love bees. Create your own dream pond in a bucket for backyard zen. Stack your apple crates (available at home depot) and nail them together for these amazing rustic shelves. Use curtain clips to store your magazines in plain view. Excellent idea for a cupboard or work room. Use your home depot apron as a desk organizer! This simple DIY project is a fun Home Depot hack to show off your loyalty!. Use mason jars with chalkboard lids for organizing your cupboard essentials! Recycle some glass bottles for your very own tiki torch. Make it here. Big plastic containers can be a reliable greenhouse. They’re also excellent for moving seeds around without disturbing. Ladies! Being a homesteader does not mean you can’t have fun, beautiful lips too! Nail 4 pieces of matching wood planks to a wall for a very nice diy headboard. Upholster your own bench by adding fabric and cushion to a plank of wood, and screwing in your own bench-feet. All available at Home Depot. (ADVANCED PROJECT). Perfectly made for storing freshly picked fruits and vegetables . Make this out of recycled palette boards, and cart wheels. This is truly a home depot hack. Take your vice out of storage and attach it to a bookshelf for a clever reinvented bookend. Make your own rolling cart to create a functional storage space for any room in the house. Here’s how. Turn some PVC pipe into a one of a kind holder for your hot beauty tools! Cut open the base of your used up liquor, and poke in your electric wires. This DIY lamp hack is a great way to show off your vast drinking abilities. Find the bottle lamp tutorial here. I never thought this was possible until now. Keep your crafts clean and tidy with PVC! Make your own kitchen tool holders out of mason jars and paint! This easy DIY Project can be found here. Make your own easy hanging lanterns for the homestead, HERE. What of these home depot hacks will you try next? Click here to shop online at HomeDepot.com. Is there a tutorial for the mosaic dish, where broken China n tiles are set into brick? Oh I meant Dish plate Mosaic … Thanks! A C-Clamp is not a vise. Someone who is supposed to be an expert in working with hardware should know this. That’s okay, we know what was meant. Visual aides also clarified. This helpful idea will help me to keep my clamps organized and easy to locate. Thank you.